Little Miss Sunshine Churchill Theatre tickets on sale now! Expect a bit of turbulence on your journey to happiness. If you happened to miss Little Miss Sunshine at the Arcola Theatre recently, now's your second chance to climb aboard the Hoover family's rickety old camper van for an unforgettable adventure at the Churchill Theatre in Bromley! 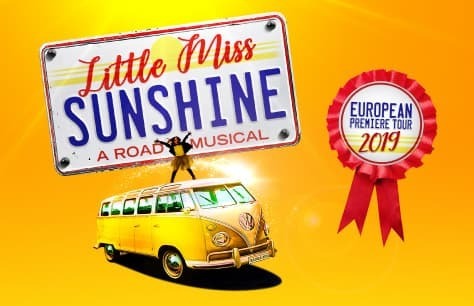 Based on the 2006 Oscar Award-winning film, Little Miss Sunshine The Musical is a spectacular new musical comedy adapted by Tony Award-winning duo William Finn (25th Annual Putnam County Spelling Bee, Falsettos) and James Lapine (Sunday in the Park with George, Into the Woods). The smash-hit European premiere, which starred two-time Oliver Award-nominated actor Paul Keating (Little Shop of Horrors, Tick Tick Boom, The Full Monty, The Wizard of Oz at the London Palladium), Gabriel Vick (Les Miserables, Avenue Q, EastEnders, Sunny Afternoon), and Ian Carlyle (We Will Rock You, The Lion King) as Dwayne, left the London theatre scene begging for an encore and it is now back for a short run in the London Borough of Bromley. You asked, Little Miss Sunshine delivered! What is the Little Miss Sunshine musical about? The Hoovers are just your average, American working-class family who've got enough problems to deal with. But when their youngest daughter Olive falls in love with a big dream to win the Little Miss Sunshine beauty pageant and an invitation to compete arrived out of nowhere, the Hoovers decide to cram into their dodgy yellow van. But can their ratchet puddle jumper survive the 800-mile drive from New Mexico to Cali? Perhaps the even bigger burning question is: can they survive each other? This heartwarming story has now become a modern classic that is fun for the whole family, and it carries the uplifting message that family should stick together, through thick and thin, and from pothole to flat tyre. Tickets for Little Miss Sunshine at the Churchill Theatre, Bromley will not last! Finn and Lapine's innovative musical theatre production of the favourite 2006 film that starred Steve Carell, is back, this time in Bromley, for a much-deserved encore. Directed by the Arcola Artistic Director Mehmet Ergen, Little Miss Sunshine is simply unmissable and it will only be at the Churchill Theatre for a limited time this May. Book your tickets now while stocks last!